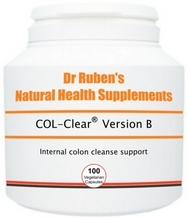 The colon’s main role in digestion is to extract water from the waste materials travelling though it. A fully functioning, healthy colon will usually rid the body of waste two to three times per day, depending on the number of meals eaten. It will also carry out the vital function of promptly discharging harmful toxins and other waste materials from the body which, if allowed to remain, would give rise to a variety of health problems, including self-poisoning (through re-absorption of toxins and bacteria into the bloodstream) and digestive system disorders. Our COL-Clear Version B formulation is virtually identical to our COL-A supplement, except it does not contain the herb goldenseal, which has been substituted with more of the herb fennel. 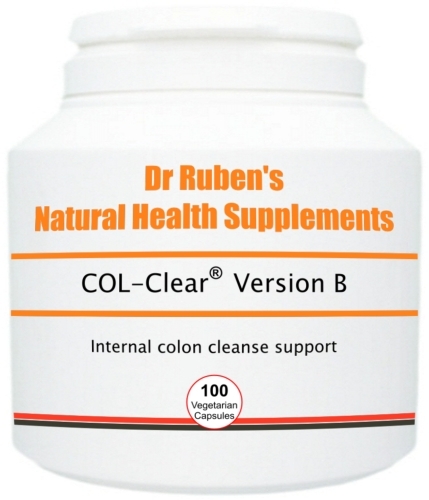 This well-known herbal colon cleanser combination is used extensively by many detox retreats, natural health therapists and colon hydrotherapists, in combination with colonic hydrotherapy sessions. It contains only natural herbal ingredients and can be combined with our other digestive health products , such as probiotics and digestive enzymes. It can also be alternated with COL-Clear A. A combination of herbal ingredients traditionally used for their ability to support intestinal cleansing and digestive transit - pure inside and out! ake 1 - 2 capsules, 1 - 3 times per day with food or as advised by your health practitioner. NOTE: Herbal colon cleansers are to be used in conjunction with improved dietary habits, increased water intake and a sensible exercise regime.